NORTH ATTLEBORO, Mass. 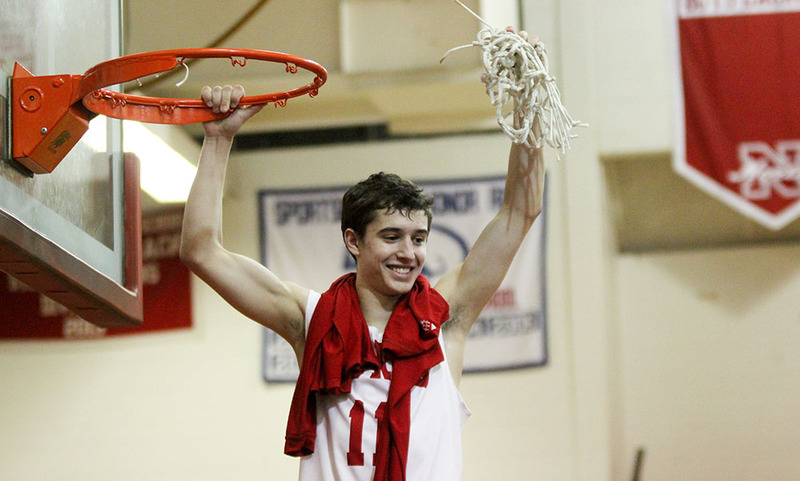 – It’s time to dust off the boys basketball league championship banner hanging inside Pickering Gymnasium at North Attleboro High School. It’s time to add 2017 to the list. For the first time since 2001, the Rocketeers are Hockomock League champions following a 45-40 win over Foxboro on Friday night. With a win, and a Milford loss to Sharon, North Attleboro clinched the division title outright. It’s been a long four year stretch for head coach Sean Mulkerrins and his squad. The Rocketeers went 0-20 in his first year at the helm, won just five games a year later and eight games one season ago. 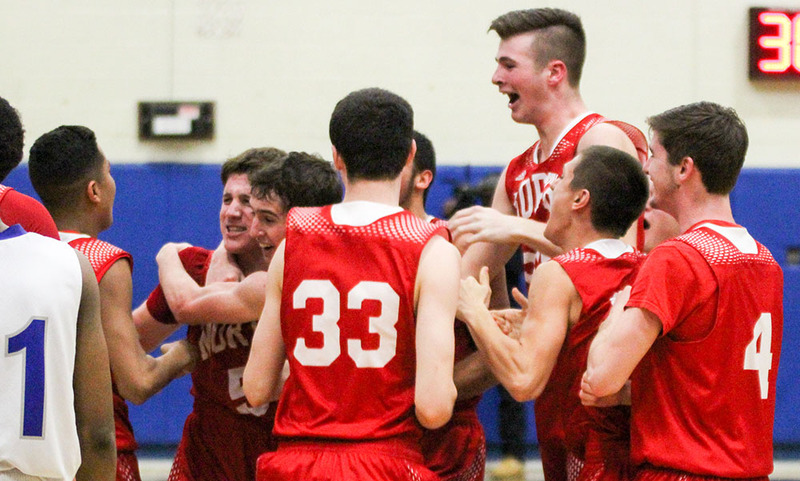 Now, North Attleboro has 12 wins with three games to go and sits atop the Davenport division as Hock champs. “To be honest, it’s been a roller coaster,” Mulkerrins said of the past four seasons. “At times, it felt like insurmountable odds, it felt like we were putting in a lot and not necessarily getting a lot. I credit [former Rocketeers coach] Chris Perron, who’s been everything to me as a mentor and a father figure when I played for him here at North, and opposing coaches like Jon [Gibbs] and Mike Vaughan who were helpful along the way. The three freshmen on that winless team were Brent Doherty, Jonny Friberg and Thomas Reynolds. All three, along with classmates Kyle McCarthy and Hacmoni Cuevas, have been a vital part of keeping the program moving forward and winning the title this season. It took a defensive stand over the final six minutes of the game for the Rocketeers to hold off Foxboro, who secured a second play finish and a trip to the postseason based on all of the results in the league. “I thought our effort was terrific all night,” said Foxboro head coach Jon Gibbs. “I thought we really battled and competed. I thought defensively we did a really good job. We came into the game with a plan to deal with Doherty and Friberg. We didn’t want them to beat us, we’re going to try and make other guys step up and make shots and they did. So give credit to North Attleboro, it was a great team win for them. The Rocketeers led by as much as 10 early in the third quarter but the Warriors fought back to make it a one possession game. North’s Hacmoni Cuevas converted a three point play to put the Rocketeers up 34-25 with 3:51 to play in the third, but Foxboro closed the quarter with a 9-3 run. After Mark Clagg and Doherty (nine points, three assists) traded three pointers, the Warriors were able to pull within three by shutting down North for the rest of the quarter and both Joe Morrison (nine points) and Teddy Maher connecting from beyond the arc. The Rocketeers led 37-34 heading into the fourth. That lead didn’t last too long. North’s scoreless streak stretched over two minutes into the final period while Morrison hit a jumper and Andrew Block (seven points, five rebounds, four assists) drove the lane for an easy two to take a 38-37 lead. While the momentum seemed to be swinging in Foxboro’s favor, suddenly it stopped. North broke through on the offensive end, with the inside-out game paying off as Friberg (12 points, 14 rebounds) kicked it out to Cuevas for a three and a 40-38 lead with 5:40 to play. Foxboro wouldn’t score again until under a minute to play. It actually took the Rocketeers two minutes to add onto the lead with Reynolds hitting a pair of key free throws to double the lead with 3:31 to play. The Warriors had a couple of open looks during the stretch, but were unable to convert. With just under a minute to play, Friberg took it baseline and somehow managed to reach back underneath the basket and lay it in for a 44-38 lead. Foxboro responded with a putback with 30 seconds to play but Chad Peterson(seven points) iced the game with a free throw as Foxboro missed on the other end. “I thought down the stretch we got some good looks and we just didn’t make them and that’s just basketball,” Gibbs said. “It’s a tough pill to swallow because at times I thought we executed fine but just didn’t put it in the basket…but that happens some times. At the end of the day, I’m really proud of them. We battled and held them to under 20 points in the second half. It was a bit of a slow start for both sides, combing for just five points in the five 5:32 of play. North eventually was able to get into a rhythm and threes from McCarthy and Billy Drummond handed Big Red a 15-9 lead after one. Foxboro cut the deficit to one (18-17) midway through the second quarter, but North finished the frame with a 9-2 run — a Peterson three, a layup from Doherty, and four straight from Friberg — to take a 27-19 lead into the locker room. 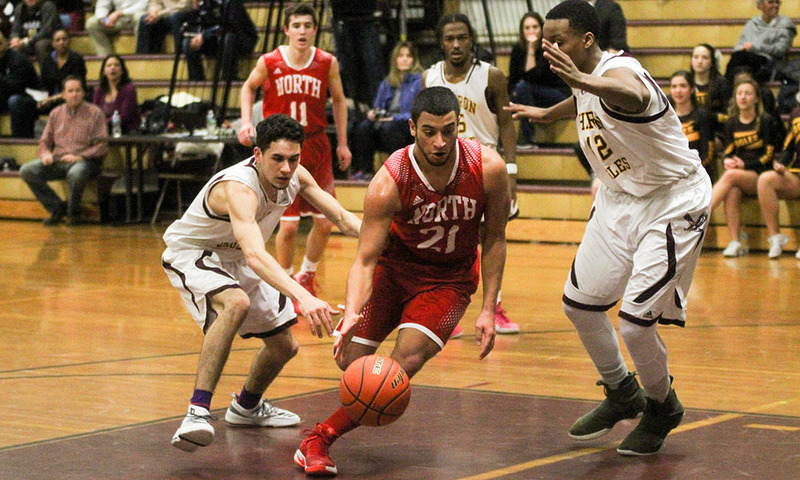 North Attleboro boys basketball (12-7 overall, 9-6 Hockomock) is back in action inside Pickering Gymnasium on Sunday when the Milford Scarlet Hawks come to town. Foxboro (9-9, 8-8) can finish no lower than second in the division, thus clinching a playoff spot. The Warriors will look to improve their record and seeding next ween as they host a February vacation tournament, starting with a game against Randolph. SHARON, Mass. – Standing at 6’6, North Attleboro senior Jonny Friberg often gives the Rocketeers the edge in the paint. But due to foul trouble, North Attleboro was forced to find other ways to keep pace with the red-hot shooting Sharon Eagles. While the Rocketeers did enough to keep pace, Friberg came back in midway through the fourth quarter. He went on to score eight points down the stretch, including the tying basket with 5.9 to send the game into overtime. And in overtime, he scored North’s first nine points and the Rocketeers came away with a thrilling 81-75 win over the Eagles. Friberg finished with a career-high 27 points and hauled in 13 rebounds to lead the Rocketeers. It seemed like there would be no stopping the Eagles, especially after they connected on their 12th three pointer (on just 20 attempts) with just under four minutes to play in the game to go up 64-55. Jimmy Fitzhenry’s (16 points) trifecta capped a 10-1 run over the first 4:09 of the period for the Eagles. But North chipped away with Friberg finally back on the court. Senior Brent Doherty (17 points, five assists) drained a three in response to stop the run and after a stop, Friberg hauled in the defensive board and then converted on the other end. Another stop and another Friberg board led to a jumper from Doherty to make it a two point game. Sharon’s Alex Kaufman (15 points) extended the lead back to four but Friberg hit back to back buckets down low to tie the game with 1:32 left. With under 30 seconds to play, Sharon senior Ricardo Ripley (17 points) came away with a steal at midcourt that turned into two free throws to put the Eagles up 68-66. Friberg took a pass from North sophomore Josh Montague (eight points) and muscled in the tying basket with 5.9 to play. Sharon’s buzzer beater attempt came up short. In overtime, it was all Friberg – no one else on the Rocketeers attempted a field goal. After Sharon took a brief lead on a free throw, Friberg converted his own miss. Reynolds drew a charge on the other end for the Rocketeers and Friberg hit a free throw on the other end. Kaufman drove to the basket to cut the deficit to two (73-71), but the Rocketeers simply went back to Friberg, who made a nice move in the post for two. Kyle McCarthy (six points, five rebounds, seven assists) hauled in a Sharon missed three and then assisted on another Friberg basket to put North ahead 77-71 with a minute to play. Along with his 17 points in the fourth quarter and overtime, Friberg had seven of his 13 rebounds. McCarthy added three free throws down the stretch and Chad Peterson (eight points, four rebounds) also had one. The nine point fourth quarter deficit that the Rocketeers overcame wasn’t the largest deficit they erased during the game. After Sharon took a 20-17 lead after the first quarter, the Eagles rattled off a 13-5 run to build an 11-point lead with less than three minutes until halftime. But a three from McCarthy, two free throws from Friberg, a put back from Montague and a corner three from Montague helped Big Red get within one. A late three from Ripley gave the Eagles a 36-32 lead at halftime. 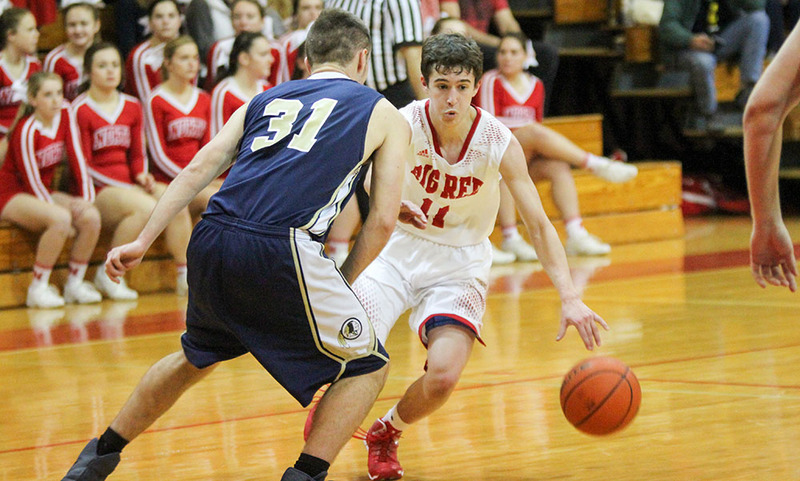 Doherty was a big reason that North Attleboro entered the final quarter of the game tied. Doherty netted 10 of his points in the third quarter alone, including a three to open the frame, a field goal that gave North it’s largest lead (46-48) and five straight points late that had the game tied 54-54 after three. Cuevas finished with eight points and four rebounds while Reynolds had seven points, three rebounds and two assists for Big Red. Malik Lorquet added eight points and nine rebounds for Sharon. North Attleboro boys basketball (10-7 overall, 7-6 Hockomock) moves into a tie for the lead in the Davenport division with the win. The Rocketeers have the chance to clinch a playoff berth on Friday on the road at Stoughton. Sharon (3-13, 2-12) has a week off until they are back in action with a trip to Stoughton on Valentine’s Day.